"This hearty salad is typical from the Liege region in Belgium. It can be made with canned beans and pre-cooked bacon strips but the fresh version is way healthier and tastier. Can be served cold as well." Place the potatoes in to a pot and fill with enough water to cover. Bring to a boil and cook until tender, about 10 minutes. Bring a separate pot of water to a boil. Add the green beans and cook for about 5 minutes. Drain. Fry the bacon in a large skillet over medium heat until crisp. Remove bacon and set aside. Fry onions in the bacon drippings until tender and browned. Remove them and set aside. Pour balsamic vinegar into the skillet and stir to release all of the browned bits from the bottom of the pan. 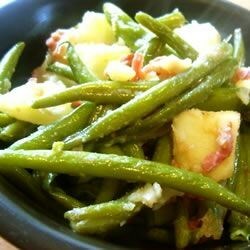 In a large bowl, combine the green beans, potatoes, onions and bacon. Pour the balsamic vinegar over them and toss to coat. Season with salt and pepper. Just before serving, sprinkle with some grated paremesean cheese...add's a little zip....and possibly a little seeded, dices roma tomatoe. Good. I used only a touch of the vinegar for sweetness. Way too much vinegar for me. I think this is best served warm, and with a bit less vinegar. I'm thrilled to find this recipe! My Belgian great-aunt made this for me years ago, and I've been wanting to make it ever since. Thanks!